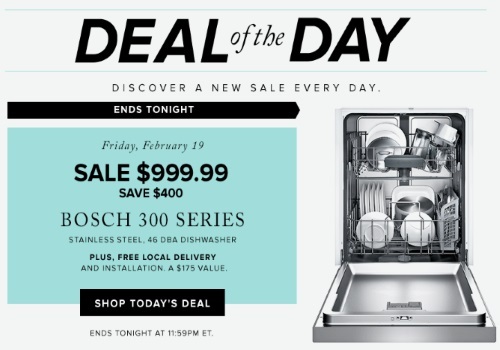 Hudson's Bay Deal of the Day is $400 off Bosch 300 Series Stainless Steel 46 DBA Dishwasher $999.99 today only! Plus get Free Local Delivery and installation a $75 value. This offer is available today only, Friday, February 18, 2016. Stay tuned tomorrow for a new deal of the day promotion.